OK, so rumors haven’t quite been spot on with the launch date for the Nexus 5 and Android 4.4 KitKat, but Google has reminded us that the day isn’t far away. Well, it did so in quite an unexpected manner, by officially disclosing the Nexus 5 to the public sans any official announcement. The device made a temporarily appearance on the Play store, but was pulled down soon. In the meantime, we managed to get the official image of the phone, but sadly though, the specifications and other information including Android related features, weren’t revealed. Let’s start with the design, the Nexus 5 (pictured below) looks exactly like you’d expect after seeing it leak numerous times. The device is a lot like its predecessor, but with many modifications. For instance, the bezel on the sides is much thinner and the rear has a polycarbonate shell rather than a textured design with a glass coating. Where specifications are concerned, the leaked manual did the needful of disclosing that the phone will carry a 4.95-inch 1080p display, a 2.3GHz Snapdragon 800 CPU, 4G LTE, 16GB and 32GB storage choices, 2GB of RAM and an 8MP OIS rear camera. Previously, reports suggested that the device would retail for $399 or $299 with 16GB of storage. 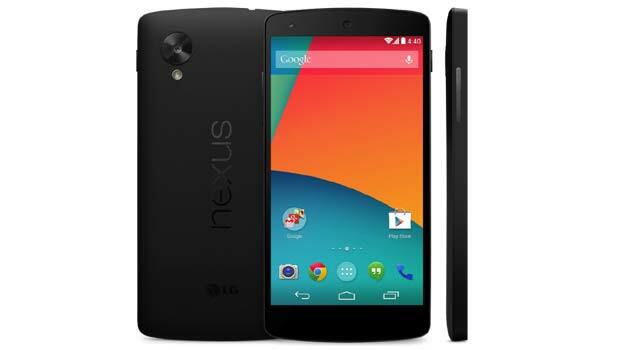 However, both prices are wrong as the Play store listing had pegged the Nexus 5 base model at $349, notes Engadget. There are also rumors that Google will bring back last year’s flagship with 4G LTE connectivity for $299 and $349 with 16GB and 32GB, respectively. We’re hoping Google has a few surprises for us when it decides to launch Android 4.4 and the Nexus 5. The latest word around town is that the giant will unveil the platform and smartphones as well as a new 10-inch tablet on October 28. Previous articleHugh Jackman teases Micromax Canvas Turbo. Seriously!